Ok, Cinco de Mayo isn’t for a couple of days yet, but I wanted to post this a little in advance to give you some time to plan. A lot of us celebrate Cinco de Mayo by going out to a Mexican restaurant and feasting on all the goodies they have to offer. It isn’t my intention to put a damper on the celebrations, but have you ever looked up the nutrition information for any of your favorite dishes at Mexican restaurants? YIKES right?! Want a margarita to go with that? One margarita can have anywhere between 350 to around 700 calories! So what is to be done if you want to celebrate, but without all the extra calories, fat, and SODIUM? Don’t go super hungry and push the chip basket to the other side of the table – way too easy to mindlessly munch away 300 or 400 calories! Get corn tortillas instead of flour. 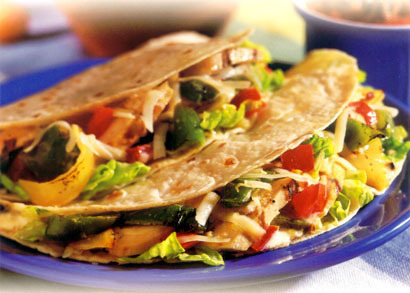 Order a la carte – portion size is one of the biggest pitfalls at Mexican restaurants or any restaurant for that matter. Ordering a la carte puts you in the driver’s seat and let’s you better control portions. Keep it simple – avoid dishes with heavy cheese sauces or other sauces. Use salsa as your sauce. Share with a friend or have your server box up half the meal before it even gets to the table. Use the plate your food was served on as just that, a “serving plate”. Have your server bring you an extra small plate and serve yourself smaller portions off of your “serving plate”. Go slowly and pay attention to fullness as you go! Go with grilled meats and pile on the veggies, adding nutrient density instead of calories.